The crude oil price started 2018 with a BANG rising from an opening $60 to a January peak of $67, a gain of 12% in less than 1 month! Whilst February saw the oil price give up all of Januarys gains by falling from $67 to $58 before recovering towards the top of the emerging $67 - $58 trading range for March which set the scene for the current rally to a 3 year high of $69. Whilst new has emerged that the Saudi's are actively pursuing lifting the oil price to at least $80 in support of their mega $1 trillion+ ARAMCO IPO. 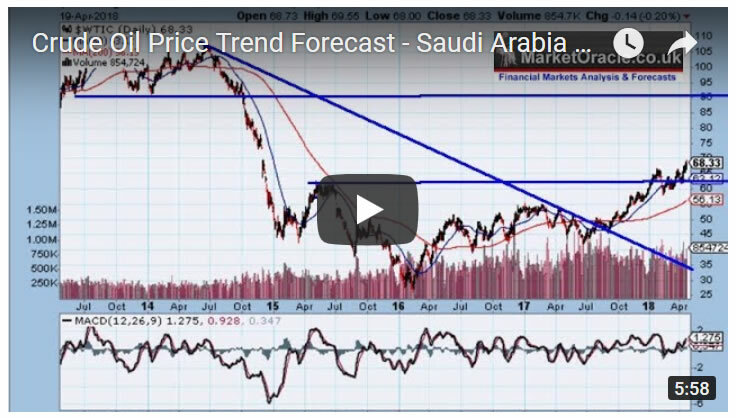 So find out in my latest crude oil analysis of what the prospects for the oil price are over the coming months, and whether Saudi Arabia will get their $80+ oil price that would allow them to dump ARAMCO stock onto the market or not. Ensure you are subscribed to my always free newsletter and youtube channel for my forthcoming in-depth analysis and detailed trend forecasts.